Dating back thousands of years, the earliest evidence of martial arts can be found in Ancient Egyptian artwork and literature depicting hand-to-hand battle scenes. Over multiple millennia, the creative, physical art form has evolved from ancient wrestling tactics to the sword dancing of the Tang Dynasty in China to the development of Brazilian jiu-jitsu in the early 1900s. The recent revitalized interest in the traditional combat system commonly known for its focus on discipline and self-defense is often attributed to mixed martial arts, a full-combat sport that combines various techniques to allow striking, kicking, and grappling. Ryan Gruhn, head instructor at Central PA Mixed Martial Arts in State College, says the popularity of the Ultimate Fighting Championship in the mid-2000s has helped to bring martial arts to the forefront of disciplined fitness in Centre County. Gruhn, who has been involved in martial arts in State College since 1992, says when he began as a local martial arts student classes were comprised of 15 or so people, at best. Now at CPMMA, school membership is around 800. Bruce Lombard, the owner of LombardMMA, formerly known as Titan Fitness & Martial Arts, agrees, saying that the popularity of UFC drastically changed martial arts, eventually leading to an increased interest and its acceptance as a sport. Though this increased interest and awareness was beneficial, Lombard feels it was also somewhat discouraging because of the UFC’s stray from some of the traditions he learned as a martial arts student in the 1980s and 1990s. 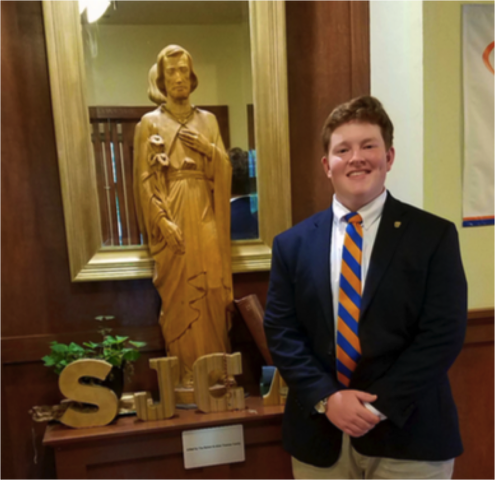 For both Lombard and Gruhn, these traditions play an important role in youth programs and their continued popularity. Gruhn says at CPMMA, children are started off with fundamental curricula in order to understand all the important skills – such as manners and respect – they will need to be successful in life. Youth programs at CPMMA begin at 3 years old and go into the teen years. Agnes Berrena, of State College, says she originally looked to martial arts for her son Nick as a way to provide a safe and structured way for him to burn off some energy, interact with peers, and gain self-control and discipline. As a high-energy 4-year-old, Nick fit right into the Mighty Mites program at CPAMMA for youths ages 3 to 5. “He loved it and I loved the way the instructors interacted with and spoke with all the kids,” Berrena says. Now, at 12, Nick is involved with the youth martial arts program and the adult Brazilian jiu-jitsu program at CPAMMA. Through his involvement with the latter, Berrena says he has been able to train with people ages 10 to 70, from beginners through professionals, all over the country. “Nick loves the mental aspect of BJJ,” she says. Even though LombardMMA no longer offers a youth martial arts program, due to the school’s location and target audience, Lombard believes in the importance of children learning structure and order through martial arts. “Number one, especially in this day and age, is giving the kids some structure; giving them discipline, which is part of what martial arts for youth is; helping them develop their motor skills, which can cross over into other things in life where physical nature is involved; and fourth is a social environment,” he says. Lombard places learning self-defense at the very bottom of the list of the skills martial arts can provide to youth. Lisa Marzka says her family originally focused on finding a place that would help teach her son, Nicholas, self-control. After enrolling Nicholas at Monarch Martial Arts Academy in State College, she quickly realized martial arts would not only teach her son self-control, but also provide him with friendship and leadership opportunities. “His favorite part is the sense of belonging and the ability to learn new skills,” she says. In addition to growth in mixed martial arts and youth programs in the area, both Gruhn and Lombard have noticed an increase in females involved in the programs at their schools. Gruhn says at CPMMA, a huge focus is placed on fostering a safe environment. All instructors at the school have received background checks, criminal history clearances, and child abuse history clearances in order to create an inviting and welcoming environment. In the late 1990s and the 2000s, CPMMA saw mostly male students. Now, 40 to 50 women are enrolled in the school’s Monday night woman’s kickboxing class. “We went from maybe one or two women in the (jiu jitsu) program, but because we foster just a safe and family environment, we’ve grown that,” he says. Lombard also attributes a surge in females involved in mixed martial arts to the popularity of UFC and female mixed martial artist Ronda Rousey. “She has empowered women. She broke that barrier and said, ‘Females can do this and be pretty darn good at it.' I think that inspired a lot of females to get involved with it,” he says. Lombard also says increased interest in mixed martial arts as alternative fitness workouts has led to an increase in female involvement. 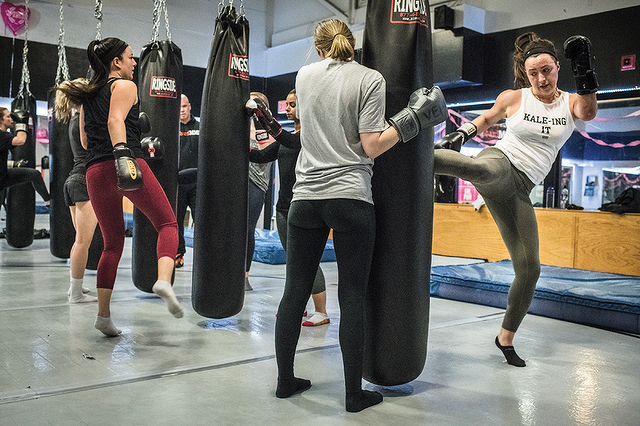 To meet the needs of women interested in the fitness element, LombardMMA offers 45-minute non-stop workouts that are taught by coaches who have trained in and competed in martial arts, creating fitness courses that teach life skills for self-defense. Gruhn agrees on the importance of self-protection, highlighting a reality-based MMA course that CPMMA offers to men and women that simulates a real-life protection situation. “It’s everything that is inside of mixed martial arts, which is all the punches and kicks, grappling, plus the reality side of it with multiple attackers, if someone were to pull a weapon on the street, and so on and so forth," he says. For both Lombard and Gruhn, knowing when to use the martial arts skills learned in the programs and respecting one’s self and others are crucial. They both believe understanding the mental and emotional components of martial arts is just as important, if not more important, than the physicality of martial arts. Gruhn says martial arts can often be a physical outlet for mental and emotional experiences. “During that time, while you are either doing jiu jitsu or kickboxing or whatever it is, that is all you are thinking about. You aren’t thinking about everything that has potentially been on your plate all day. You’re not thinking about work or that incident that happened five years ago that still haunts you. That is huge,” he says. Berrena encourages parents to think about martial arts as an avenue for their children to learn respect, to develop and increase their self-confidence, and to compete with honor. 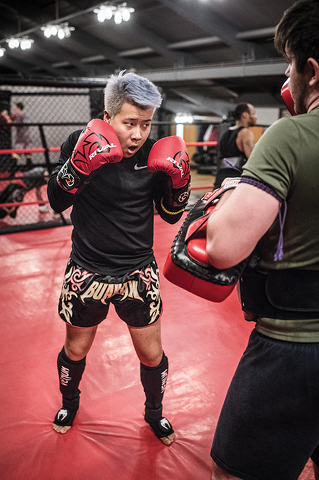 Lombard stresses that people must look past the physical combat portion of martial arts to understand that at the core, martial arts is just as much a mental and emotional workout. Samantha Chavanic is a freelance writer in Bellefonte. Samantha Chavanic is a freelance writer living in Bellefonte.